Whilst much of the country lay on the sofa sleeping off the festive season, bemoaning the dark days and cold weather, our Striders were straight out there hitting the roads and trails! A very busy New Year’s Day was quickly followed-up by some competitive showings in the few races which graced January. Gary enjoying his run at the Yorkshire Championships! Lightwater Valley was the venue for this year’s championships, so it was no surprise to see several Striders taking up the challenge. In the shadow of ‘The Ultimate’, the course took our intrepid Striders on a rollercoaster off-road circuit around the estate of the former strawberry farm. Indeed, it proved a fruitful day with some great results in a tough field which even included a Brownlee brother! In the ladies’ category, Julie Elmes led a trio of Striders in 43:08, followed by Fyn Lees (46:33) and Edwina Wilcox (49:33). The men were represented by James Wright (41:47), Gary Wilkinson (45:00) and Sean Brennan (48:52). The field proved incredibly strong, yet our Striders will move on fearlessly to an even greater challenge at the National championships on February 23. Edna searches for the finish of the PECO 3rd round! The West Park Round of the PECO cross championship saw the half-day point (well, mid-race, kind of…) of an increasingly competitive championship. 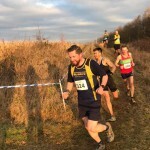 With the club having showed well in several of the categories, another strong turnout saw Striders remaining in the hunt for some fine team results at the season’s end. Issy Rowe once again provided the stand-out performance, finishing 16th overall in 36:32. She was chased in by two ladies both riding high in their respective categories: Sima Lowery (39:58) and Sue Morley (46:59). 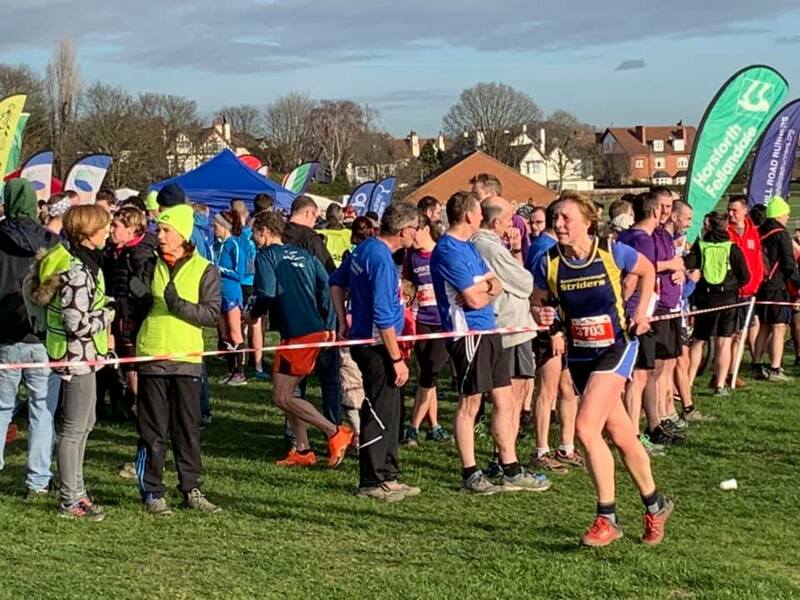 A strong ladies’ turnout was completed by Lisa Harrison (47:20), Julie Elmes (47:32), Pamela Singleton (50:26), Strider-of-the-year Edna Wood (50:34), June Graham (52:25), Fyn Lees (52:33), Kez Welsby (53:27) and Sally Taylor (53:39). This strong set of results left our ladies a super 2nd position in the Second Division. 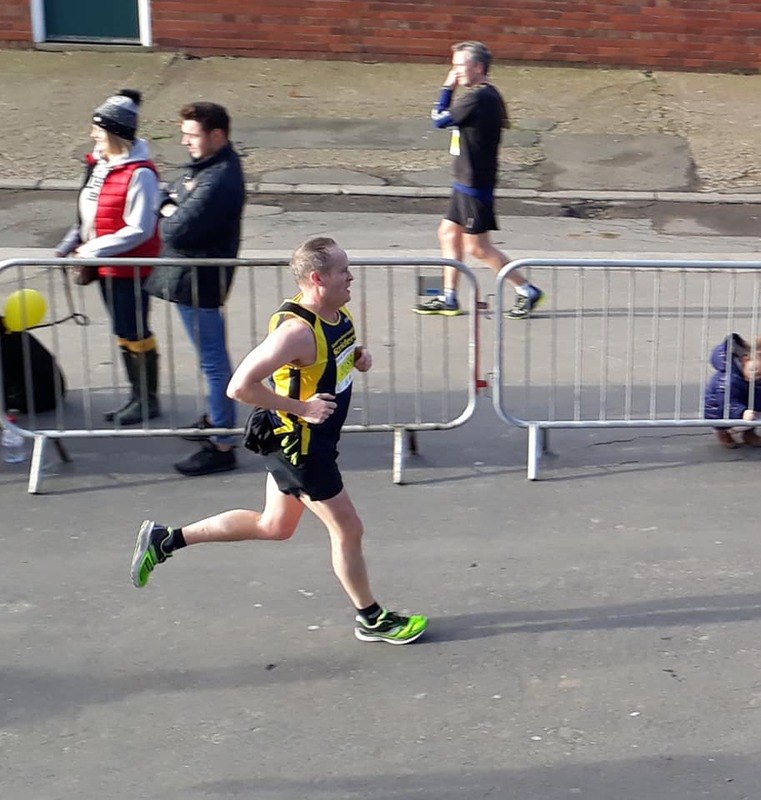 In the men’s category, the strong Ted Welton (34:34) overcame a stern challenge from James Wright (35:26) to lead the men home, followed-in by Martin Brock (36:24), Phil Cornforth (36:52), Gary Wilkinson (39:17), Mark Shelton (44:46), Andy Tibbals (45:06), Ian Mitchell (45:20) and Green Jason (46:31). This gave our gents a creditable 5th place in the Second division. The challenge would continue a fortnight later. Sean completing a fine but frosty run at Brass Monkey Half. Based at York Racecourse, places are highly sought-after at one of the earliest half-marathons of the year. A very crisp and breezy wintry morning greeted our Striders, who put in a range of competitive performances on the flat but exposed course south-east of York. James Wright and Steve Morland worked in tandem to produce a fine pair of PBs, coming home in 1:24:40 and 1:25:25 respectively. They were joined in collecting their lilac tops by Philip Cornforth (1:33:39), Sean Brennan (1:44:01), Julian Carr (1:48:27), Jonny Chadwick (1:54:01) and Fyn Lees with a PB of 2:03:01. TNT should be treated with great caution – dangerous, explosive and capable of inflicting great damage. And it proved to be so at the Temple Newsam Ten-mile race (‘affectionally’ known as TNT) as a quartet of Striders lined up to take-on the challenge. Starting and finishing in the beautiful grounds of Temple Newsam House, the course proved as brutal as it was beautiful! David Halladay was the first of our Striders home in 1:25:42, followed by Lisa Harrison (1:33:12), Sarah Gore (1:45:19) and Dawn Richardson (1:57:28). Not one for the faint-hearted, the High Fells of Hedgehope run takes competitors to the summit of the magnificent Hedgehope, the second highest summit in the Cheviots and ascending 2,600ft in the process! A refreshing splash through a river provided a fitting end to a tough challenge! James Warburton finished an incredible 7th overall in 2hr 39min, joined by Beyhan Akyollu who put in an excellent run in 3hrs 59min. Well done both! Some of the 29 Striders attending Round 4 of PECO XC! 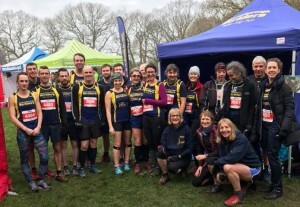 The penultimate round of the Cross-Country championship was much closer to home, with Harrogate Harriers hosting an event in Crimple Valley. 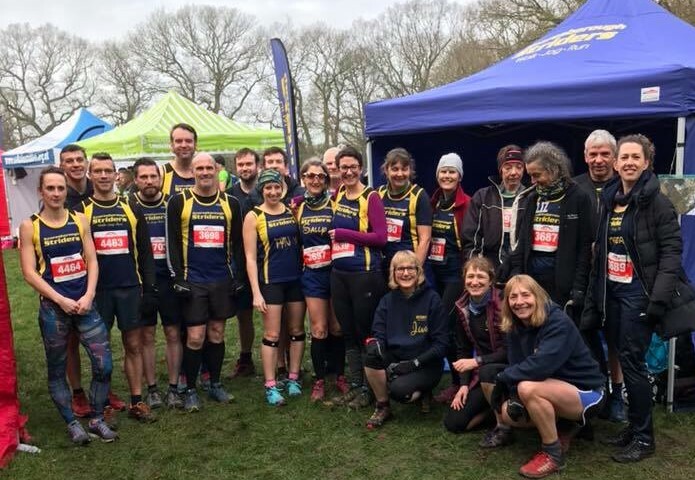 The strong Striders turnout throughout the season was boosted further – no doubt by the attraction of an extra hour in bed – to a fantastic twenty-nine runners! After a blazing downhill start, the truly diverse course included an undulating mix of tarmac, gravel, mud, rock and woodland trails, with a beastly final mile in the soft, steep fields south-west of the Great Yorkshire Showground. Once again, Issy Rowe led our ladies home, placing 15th overall in a very competitive 31:15. A further sixteen Striders followed her home: Sima Lowery (34:08), Catherine Morland (36:18), Amy Naylor (37:43), Lisa Harrison (38:42), Sue Morley (40:32 (1st in category), Fyn Lees (41:21), Gosia Przybyl (41:42), Edna Wood (42:13), Pamela Singleton (43:43), June Graham (43:50), Sarah Gore (44:33), Deborah Goldfield (45:10), Kez Welsby (45:37), Lizzie Medwell (47:54), Sally Taylor (49:26) and Ruth Bowen (52:58). Another 2nd place in the Ladies’ 2nd division was a fitting reward for a very fine performance by our runners! Our men placed 4th in their 2nd division on this occasion, thanks to Steve Morland (29:31), James Wright (30:12), Phil Cornforth (31:08), Gary Wilkinson (32:26), Sean Brennan (34:10), Ian Mitchell (35:59), Stewart Hymas (37:05), Andy Tibbals (38:17), Mark Shelton (38:36), Jason Green (39:02) and David Sinton (42:49). 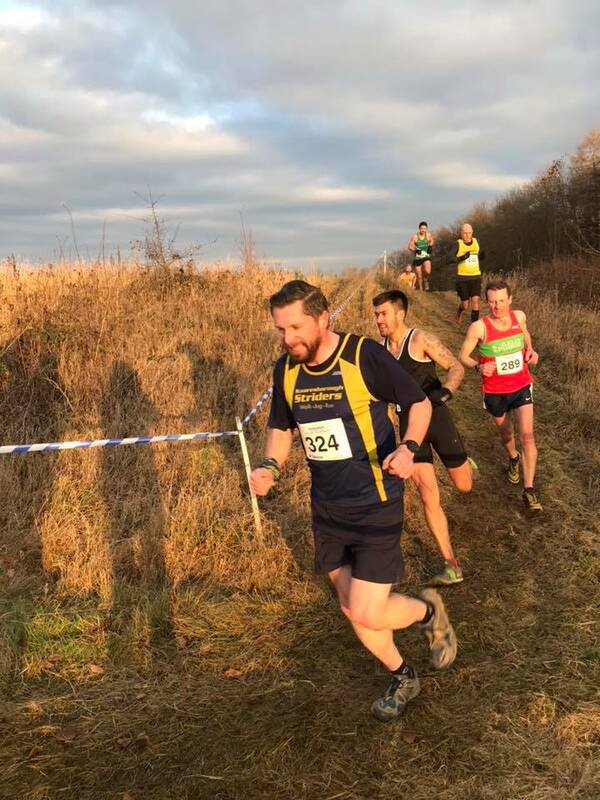 Things should move up a gear in February with a wider range of events including: Dewsbury 10, PECO Round 5, Muddy Boots, the commencement of our Club Championship at Liversedge half, Harewood half and 10k, The Bloodaxe challenge and the National Cross-Country championships at Harewood to name but a few!